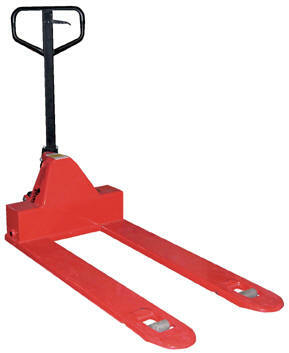 The Low Profile Pallet Truck enters pallets from all four sides. All steel frame is reinforced to handle 4,000 lb. capacity loads. Wide loop control handle with lift, neutral, and lower functions provides fingertip control. Lifetime lubricated bearings. Hydraulic system has hard chrome plated pump piston with polyurethane seals. Suspension system has a heavy-duty thrust bearing. Complete with adjustable push rods, polyurethane wheels, steel load rollers and red powder coated finish. Specs: fork service range 1-7/8" to 6"; capacity 4,000 lbs. Available in overall fork dimensions of 20"W x 48"L, 27"W x 48"L, and 33"W x 48"L.